The Aurora HD 24” widescreen desktop magnifier offers the largest viewing area of any video magnifier, providing plenty of space for reading, writing or doing hobbies! 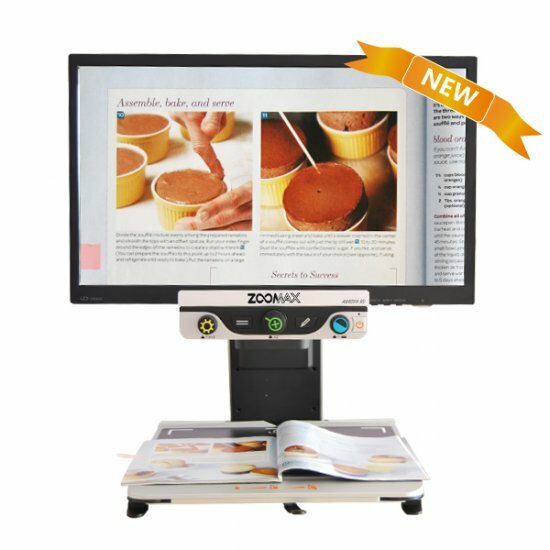 With the combination of an LCD monitor and custom HD auto-focus camera, you can be assured to get the best image quality available at all magnification levels. Designed with the end-user in mind, the Aurora HD is fully customizable. Adjust the viewing monitor vertically or horizontally until it is in a comfortable position and then set your level of magnification, high-contrast color settings and brightness to ensure you have perfect picture quality every time. Use the horizontal or vertical reading guides to help you keep your focus as you read and when you have finished, save those settings for future use. Equipped with basic and advanced user modes the Aurora HD is the perfect desktop video magnifier for users of all skill levels. The placement and function of all knobs and buttons is based on years of research providing the most intuitive interface possible. The Aurora HD is so versatile it is not only used for reading but also for writing, painting, drawing, sewing, viewing photos and much more.